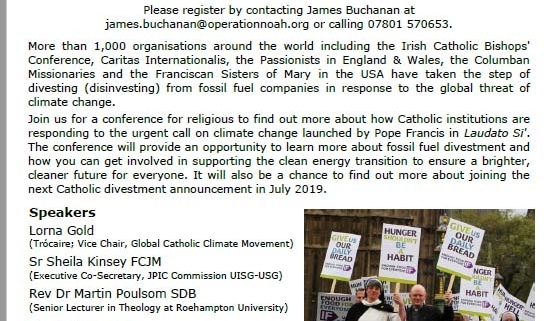 “More than 1,000 organisations around the world including the Irish Catholic Bishops’ Conference, Caritas Internationalis, the Passionists in England & Wales, the Columban Missionaries and the Franciscan Sisters of Mary in the USA have taken the step of divesting (disinvesting) from fossil fuel companies in response to the global threat of climate change. james.buchanan@operationnoah.org or calling 07801 570653. Free. Please bring something for a shared vegetarian lunch.